[SOFT MATERIAL] : Acrylic material. Super warm cape scarf. Soft as cashmere and warm as fleece. Wrap the shawl freely around any outfit, it will keep you warm and cozy in the whole winter. [SIZE AND PLAID PATTERN]: 55\"(L) x 55\"(W). 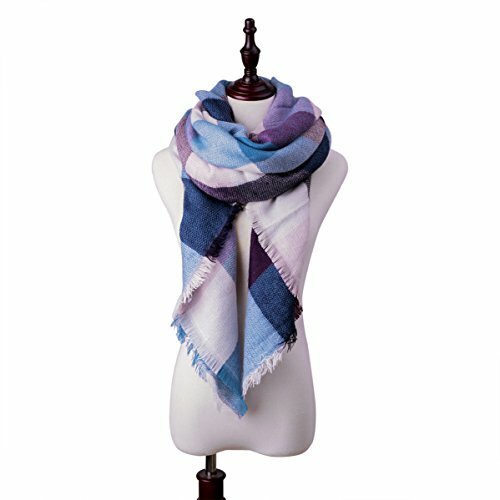 Large size, elegant squared blanket scarf/wrap in checked patterns can match any outfit you wear. It\'s a true square so you can easily fold it into a triangle for a variety of scarf techniques. Perfect for attend a party, family travel, work, it is suitable for you in different occasions. [PACKAGE & GIFT CHOICE] : Delicate package，each scarf is packaged in a flat plastic zip bag with the scarf folded very neatly inside - perfect for gift giving. Each is gorgeous. If you want a luxury one, just purchase it. There is always a will for you. [OUR PROMISE] 30 days no-hassle refunds or returns, just contact us if you have any question. You will get friendly customer support. Great scarf and doubles up as a blanket!